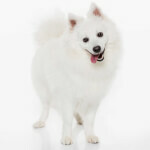 The Japanese Spitz is a small- to medium-sized breed with a long, luxurious double coat that is always white in color. First bred in Japan in the early twentieth century to be a companion dog, the typical Japanese Spitz is personable, lively, and a bit strong-headed if not given proper training. Dogs of this breed are low-maintenance, healthy, and extremely clean. The Japanese Spitz, like most other Spitz breeds, is a member of the Non-Sporting Group. This breed was created in Japan in the early twentieth century to serve as a personal companion dog; they are best suited for families with children, busy singles, or seniors who need a companion. Some Japanese Spitz facts: they are small- to medium-sized (at 10-20 pounds, they are essentially a larger version of a Pomeranian), they only exist in white (and their coats are fairly dirt-repellent), and they are low-maintenance overall. They are also intelligent and willing to please, which makes them easy to train. Incredibly "tidy"; normally keep themselves clean and have no "doggie odor"
The Japanese Spitz is a small- to medium-sized, all-white breed that is active, affectionate, and clean. Since they were created to be personal companions, dogs of this breed are attentive, fun-loving, and highly sociable. They are also healthy, with very few genetic issues, and they have a fairly long lifespan. The following info will teach you all about your Japanese Spitz! Japanese Spitz information regarding intelligence: this breed is pretty bright, and will normally learn tricks and commands fairly easily. Owners will need to provide consistent training (beginning when the dog is a puppy if possible) to ensure that stubborn and willful behavior patterns don't set in. If owners teach their dogs to obey as puppies, these Spitzes should be intelligent, obedient dogs once they mature. True to its breeding, the Japanese Spitz makes a fantastic companion. These dogs normally develop complex, almost human relationships with their owners; interestingly, many Japanese Spitzes "play favorites" with human family members, and often pay the most attention to one human of their own choice. If properly trained in obedience, these dogs often assume the role of "family cheerleader," and will display affection to those who most need it. While not overly strong, dogs of this breed are plenty lively, and will spend a lot of time scampering around the house or yard with curiosity. They also enjoy the physical (and mental) stimulation of a long daily walk. Japanese Spitz history, appropriately enough, begins in Japan in the early twentieth century. 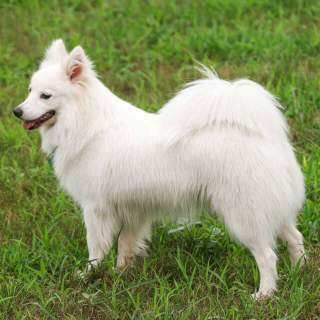 Various Spitz breeds--characterized by thick, fluffy coats, and small muzzles and ears--had existed in Asia for centuries, but Japanese breeders apparently sought to create a small- to medium-sized, all-white Spitz breed that would make a good personal companion. 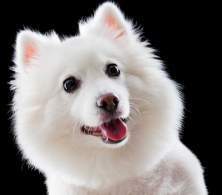 So the breeders, starting in the mid-1920's, began selectively crossbreeding various Spitzes like the Samoyed, the American Eskimo Dog, the German Spitz, and the Russian Spitz, many of which had to be imported from other countries. After about two decades of crossbreeding, this all-white dog type had a clear genetic makeup, and thus was considered its own breed. Some consider the creation of the Japanese Spitz, with particular attention paid to its color and friendly temperament, to be the first example of a "designer dog." By the 1950's, the breed was firmly established. In 1954 the Japanese Kennel Club awarded the Japanese Spitz its official recognition, and published a breed standard soon thereafter. The breed slowly made its way into Europe, and eventually arrived in North America. Today, Japanese Spitzes can be found in most major countries in the world; though considered fairly rare, the Japanese Spitz is prized for its striking looks and affectionate temperament. The breed is not recognized by the American Kennel Club, but is recognized by most other canine organizations. 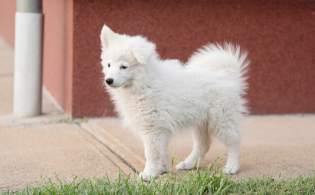 The Japanese Spitz is small- to medium-sized but their thick, bushy coats may seem to make dogs of this breed appear larger than they actually are. These dogs' bodies are normally about equal in height and length. With plush coats and squarish bodies, these Spitzes can almost resemble stuffed animals. This breed's head is fairly small, with triangular, erect little ears, a short muzzle, and large-sized, oval eyes that are normally dark brown in color and extremely expressive. The chest is deep and broad, back straight, and belly a bit tucked-up, making the torso very flexible. The legs are short and straight, the feet are small, and the tail is long, bushy, and normally curled up over the back. 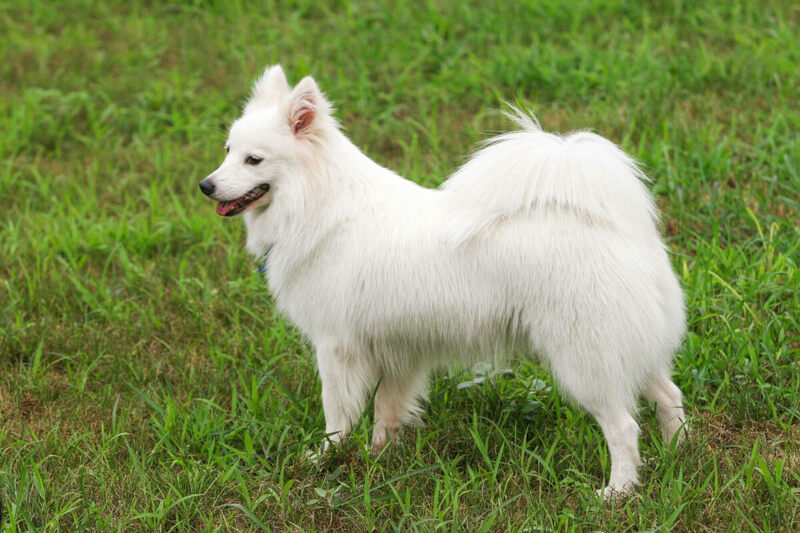 The typical Japanese Spitz coat is thick, long, and double-layered. The outer layer is often thickest at the scruff of the neck and on the tail, contributing to the dog's "plush toy" appearance. Unfortunately, for many dog seekers, the Japanese Spitz does not exist in black or brown. Due to years of selective breeding, Japanese Spitzes exist only in white. Depending on a dog's age or the lateness of the shedding cycle, a white Japanese Spitz may appear yellow or cream in color, but the fur will return to dazzling white when the new hair replaces the old. Japanese Spitz size can vary slightly between the two sexes. 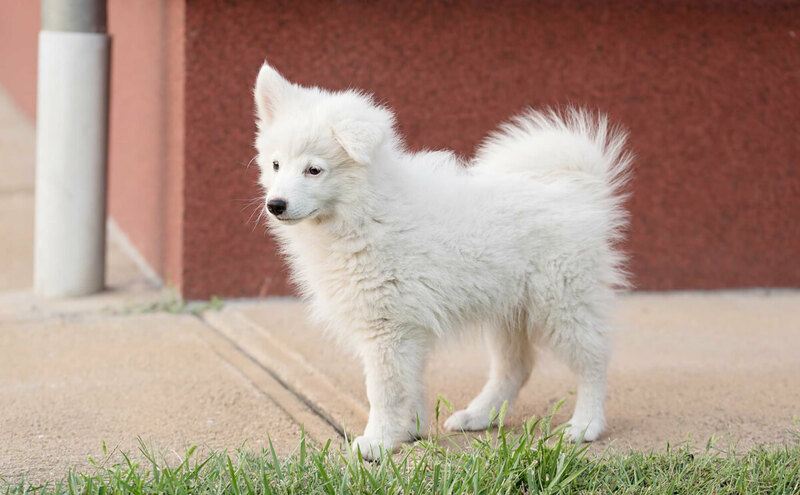 Fully grown Japanese Spitz males are usually 13-15 inches at the shoulders in height, and 17-20 pounds in weight; females are 12-14 inches in height and 10-14 pounds in weight. There are no known variations in the size or coat of this breed. While some owners may claim to have a"toy", "teacup" or a "miniature" Japanese Spitz, this is a misnomer; the dog is either a very small Japanese Spitz, or a Pomeranian (which, if solid white, looks practically identical). Japanese Spitz are not short haired dogs and do shed; most owners choose to keep the natural coat and do not clip them. Affectionate, loyal, proud, obedient, and fussy at times, the Japanese Spitz temperament is one of feistiness, energy, and intelligence. Since they were bred to be family companions, these dogs are attentive and extremely loyal to their human "pack"; they will enjoy being part of any family, whether it's watching TV or playing a game of tag football! Dogs of this breed crave human attention--so much so that they often develop human-like personalities themselves--and can be a little ornery if they constantly feel left out. While they will usually be reserved around strangers, they will be affectionate towards them once they're used to the stranger's presence. In regards to training, the Japanese Spitz does pretty well. These dogs personalities blossom best if they are trained as puppies; owners can teach them proper obedience at a young age by using firm, consistent, repetitive commands. Unfortunately, Spitzes that are not properly disciplined, and allowed to "rule the roost," can develop Small Dog Syndrome. Japanese Spitzes characteristics also include being prone to barking quite a bit; the good news is that this vocal tendency, combined with their natural curiosity, makes these Spitzes great watchdogs. They will normally sound off--loudly!--if confronted with an unknown sight or sound. Dogs of this breed are playful, loving, and sensitive--and exceptional playmates to children and adults alike. Since a baby Japanese Spitz is basically a walking, breathing plush toy, these puppies will be adored by everybody. And as they mature, these Spitzes will happy participate in playtime with the kids, no matter how boisterous it gets. As highly social animals, these dogs normally get along well with other pets. Owners attest that a Japanese Spitz and cats or other pets will socialize best if they are raised together. Below are pictures and images of the Japanese Spitz. As companion breed, a Japanese Spitz will be happiest if it is treated like a member of the family. Dogs of this breed thrive on human attention, and will exhibit unwanted behavior--barking, destructiveness, etc.--if ignored too much. They may also might be standoffish to unknown people, but typically warm to them quickly. These Spitzes are adaptable to any living situation. As long as they receive proper attention, they will be fine in an apartment or a house; as personable dogs, they will prefer living inside with the family as opposed to being kept in a yard. If taught proper obedience (and not allowed to "run the show"), these dogs will make welcome family additions. Though clean and tidy, the Japanese Spitz is not hypoallergenic; the breed sheds a good bit, and may not be the best choice for allergy suffers, or for those not willing to deal with unwanted pet hair. This is an extremely healthy breed overall. The main health issue for Japanese Spitzes is patellar luxation, a condition in which the dog's kneecap slips out of joint. A few dogs of this breed may suffer eye issues--most notably, what's known as "tear staining," a condition in which the Spitz's eyes, due to abnormally small tear ducts, will produce red or brown tear stains around the eye openings. This condition is not due to a serious defect, and is usually only temporary.